How Does “over exposure” to the Sun damage your Skin? Wrinkles are a natural part of the aging process and are most evident on sun-exposed areas of your skin, such as your face, hands, neck, and forearms. 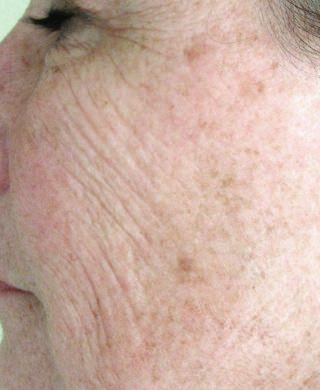 Wrinkles (also known as rhytids) are the lines and creases that form in your skin. If your wrinkles are severe, they can develop into furrows or deep crevices. These deep wrinkles occur more frequently in the vicinity of your mouth, eyes and neck. Wrinkles are caused by the loss of the structural integrity of the connective tissue in the outermost layers of your skin. This degenerative process leads to a reduction in the volume of connective tissue, the ability of this tissue to hold onto water and the deterioration of the elastic properties of your skin. Consequently, your skin becomes thinner, weaker, loses its elastic properties and eventually starts to fold on itself resulting in wrinkles. Genetics – Your genetics are an important cause of any and all conditions (including skin and medical conditions). Those persons that have very fair skin (Fitzpatrick Classification I and II) are more likely to develop wrinkling. The Aging Process – As you age, your body begins to suffer from the loss of all types of vital reserves including hormones, minerals, vitamins, amino acids and connective tissue. This diminishment of building materials leads to a weakening and loss of function of all the organs, tissues and cells in your body. Consequently, as you get older, your skin (which is the largest organ in your body) becomes less elastic, less resilient, thinner and weaker. Additionally, your sebaceous glands decrease production of your natural oils resulting in loss of moisture and leading to dry and dehydrated skin. There is also loss of fat (adipose tissue), connective tissue (glycosaminoglycans, collagen, and elastin) in the intermediate and deeper layers of your skin. This aging process eventually leads to loose, saggy skin and the appearance of lines and crevices. Ultraviolet (UV) Light Exposure - Ultraviolet light, while vital to your health, in excess can accelerate the natural aging process and lead to early wrinkling. Excess UV exposure can damage skin's connective tissue. Repetitive Facial Expressions- Squinting, smiling, frowning and other facial movement and expressions will, over time, lead to folding of your skin which may manifest as wrinkles, fine lines, furrows and crevices. Every time you contract your facial muscles, a fold forms beneath the surface of your skin. As your skin ages, it begins to lose elasticity, strength and integrity and therefore can no longer return to its original shape and position. Eventually these temporary facial expression folds can become permanent wrinkles on your face. Sleep wrinkles - Sleep wrinkles are the result of compression of your facial skin against a pillow or bed surface in sleeping positions where you are lying face down. Sleep wrinkles appear in expected anatomical locations on your face and are often distinguishable from wrinkles caused by normal aging or from repetitive facial expressions. Sleep wrinkles can worsen over time and become permanent unless you avoid the wrinkle producing sleeping positions which caused them in the first place. Smoking – Cigarette smoking is a highly destructive habit which accelerates the rate of aging in all of the tissues in your body, including your skin. Other Unhealthy Lifestyle Habits – Any unhealthy lifestyle habit, like inadequate sleep, poor diet, excess stress, lack of rest, the use of drugs and alcohol will accelerate the loss of vital reserves and aging process in all of the tissues in your body including your skin. Your skin health is a reflection of your internal health. If you want your skin to look youthful and healthy, then you must practice healthy habits. How Can I Reduce and/or Prevent Wrinkles? One of the best ways to prevent wrinkles is to not get old. While this is actually impossible, there are nutritional and metabolic therapies available that can slow down your aging and keep you looking healthy and youthful. Unfortunately, much of the nutritional information that is popularized by mainstream sources actually leads to premature aging and hence premature wrinkling. Compare the face of a person who smokes cigarettes, drinks too much alcohol and who engages in other unhealthy practices to someone who does the opposite (someone following a truly healthy lifestyle) and the difference in skin aging is very apparent. Cosmeceuticals products contain biologically active ingredients that are topically applied that represent a merging between cosmetics and pharmaceuticals. Cosmeceuticals can improve appearance of your skin but unlike cosmetics (which merely cover up your skin imperfections) work by delivering nutrients to your skin to make your skin healthier. There are currently countless varieties of cosmeceuticals on the market and they typically claim to improve your skin tone, skin texture, make your skin glow and reduce your wrinkles. Cosmeceuticals are the fastest-growing segment of the natural personal care industry. Cosmeceuticals usually contain vitamins, herbs, various oils, and botanical extracts and may provide benefit (or harm) to your skin. How well cosmeceuticals work depends on many factors including your skin type, your skin condition, the specific ingredients these biologically active substances contain and how well these products penetrate your skin. Topical Vitamin A (also known as retinol and retinoids) — such as natural retinol or synthetic derivatives like tretinoin (Renova, Retin-A) and tazarotene (Avage, Tazorac) — may reduce fine wrinkles, uneven skin tone and rough skin. Retinol and retinoids work on a molecular level because your skin cells contain receptors for retinol and retinoids that help regulate functions of skin turnover and repair. As you age and have suffered photodamage (from sun exposure) these functions become dysregulated. However, if you use retinol or retinoids on a regular basis the repair and turnover of your skin cells will become more normalized. Retinol and retinoids improve your skin texture and reduce your uneven skin tone by accelerating the rate that your skin cells regenerate and repair themselves. The most important effects of retinol and retinoids are on your collagen (one of the major building blocks of your skin). Retinol and retinoids can prevent the overproduction of an enzyme called collagenase (which breaks down your collagen) while at the same time also helping to stimulate the production of new collagen. Retinol and retinoids are amongst the most powerful and effective anti-aging ingredients available, and can be useful regardless of your skin type (Fitzpatrick Classification). Botox – is an injectable drug derived from Botulism toxin type A which causes a temporary paralysis of the tiny muscles in your face which allow you to make facial expressions. The drug is injected in small doses into very specific facial muscles and keeps your muscles from contracting. When your facial muscles cannot contract, your skin appears smoother and less wrinkled. Botox is most useful for treating frown lines between your eyebrows and across your forehead and on the corners of your eyes known as crow's-feet. A typical Botox injection lasts about three to four months. Repeat injections are needed to maintain your results. Laser Treatments - Laser and other radiofrequency treatments are used to create an injury to your epidermis and dermis, stimulating the growth of new collagen fibers in your skin. Over time, as your skin heals, your new skin can have a smoother and tighter appearance. The healing time for these types of procedures can take up to several months. Risks include scarring and lightening or darkening of skin color. Soft Tissue Fillers - Soft tissue fillers are biological substances that are injected into the deeper wrinkles of your face to help temporarily reduce your furrows and wrinkles. These fillers include such substances as fat, collagen and stabilized hyaluronic acid like Restylane, Juvederm, and others, can be injected into deeper wrinkles on your face. The procedure may need to be repeated every few months as these substances eventually are reabsorbed into your skin and lose their effect over time. Face Lifts - A face-lift is a surgical procedure usually performed by a plastic surgeon which involves removing the excess skin and fat from your lower face and neck while simultaneously tightening your underlying muscle and connective tissue. A properly done face-lift can provide aesthetic improvements in your appearance for approximately five to 10 years. "Following a surgical procedure/liposuction, it was Delma Rothman who provided techniques and recommendations on how I could adjust to post-surgical needs. Her series of massage treatments truly relieved my pain, speed up my recovery and healing process."